Age requirements 7.0 by September 1st. This class is the first full hour ballet class for our young dancers. Ballet Basics at Charlotte Klein Dance Centers serves as the full introduction to classical ballet technique. This class will deepen your child’s knowledge of ballet-specific terminology, movements and overall style. 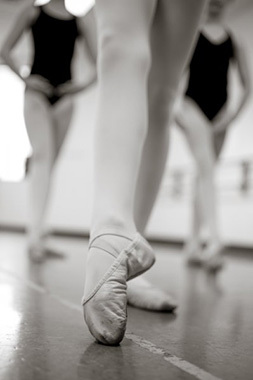 Your child will learn technique and movements specific to ballet, as in our K-Dance and Danceworks classes, and further this knowledge by focusing on these steps alone for the full hour of class. Ballet terminology will continue to be taught and reinforced in this class, so that your child becomes familiar with all the terms they will use later as they advance their ballet lessons. It is in this class that our dancers gain awareness of the body while building a solid foundation of classical ballet technique. Classical ballet is the root of all dance styles. Taking this class will help your child strengthen their dance knowledge; they will be able to take the training they have learned in this class and apply it to other dance styles. This class is a great starting point for any young, serious dancer – regardless if they continue ballet lessons or choose a different style of dance to continue learning. The Ballet Basics class, like our other introductory classes, will perform in our annual recital.